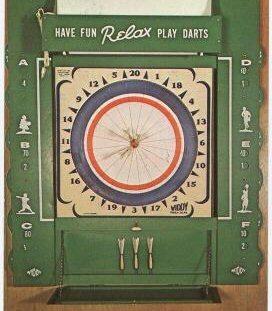 The number of specific dart games that can be played on an American board is realy only limited by your imagination. Any of the games can be played by individuals, or by teams. Any location on the dartboard can be chosen to qualify as a scoring section, although some are more popular than others. Besides the basic game that is called, you can add any of these variations . . . Simply put, if a player throws a dart into the ring on the blue board, all of his points for the inning are wiped out. This can be added to any dart game. One example might be, "One to Three, Split Darts - Blue Kills". This idea fits better with some games than others. For instance, Blue Kills on a Trip 13 game is very harsh. I mentioned this on the Team Games page. A minimum scoring level can be set, so that any number of points below that level will not be credited. This can be done on a per man, or per team basis. One example of a game like this might be "One to Nine - Six or Better to Count". In a game like this, certain locations qualify for a "rethrow". You can pull any darts that land in that location, and throw them again. Often beginning players like to play "Baseball - Pull Your Reds" where any dart landing in the red ring in that inning can be rethrown for additional points. I've seen players play "Shoot the Cork - Pull your Corks" where they throw all three darts at the cork. If they hit a cork, they pull that dart and shoot it again. This is the dart version of "Who Wants to Be a Millionaire". The idea of a progressive game is that players can earn points as long as they are scoring points. As soon as you miss a dart, you lose credit for eveything you've earned that inning. These games are usually split dart games (5 - 20 - Ace seems to be the most popular). If a player hits points with the first dart, they can quit shooting and get credited for the points. If they shoot a second dart and miss, they get no points. If they hit with the second dart, they can once again take credit for the points and quit the shooting round. The shooting round ends when they either miss (and this can happen on the first dart), they decide to quit and take the points, or after they hit all three darts. As if there weren't enough different ways to play darts using the board itself, there are some general merriment games that people play that make use of props. The most popular is the the . . . In this game, a dollar bill is taked up to the board over the cork. Players each ante a bet (a dime, quarter, dollar - whatever you want to play for). Players get three darts. The object is to hit the dollar with all three darts. Whoever hits the dollar bill all three times wins the pot. You should be able to clearly see the hole in the bill for it to count, grazing the bill will not count. The first dart is thrown from the throw line. 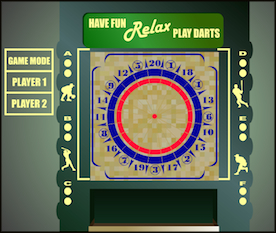 If the player hits the dollar, they take one step forward, and throw their second dart. If they hit the dollar with the second dart, they go to the throw line and take one step backward to throw the third dart. Although it sounds simple, it's not. If no one hits all three darts during thier turn, players make another ante into the pot. Using a deck of cards, each player is dealt 3 cards. The cards are kept secret. Choose player order by shooting cork or drawing cards. The shooter chooses a card from his/her hand and shoots at the corresponding inning. (Jack=11, Queen-=12, and the King=13, no jokers) When the shooter hits the triple in the corresponding number, the card is dead. The first player to have all his/her cards killed, wins. Each shooter gets three darts per inning. If another player has the same card that is killed by the shooter, his/her card is also killed.